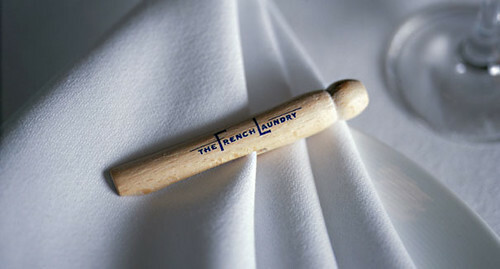 The French Laundry has taken on a mythical status, an impossible restaurant firmly entrenched in foodie pantheon. There may not be a more oft-mentioned destination restaurant besides El Bulli. It’s tucked away in Yountville, California, a less and less probable place for Thomas Keller’s vision – a Disneyland-type simulacrum for those following the Napa Valley wine trails. Indeed, the restaurant’s critics might say the location is representative of the food one will encounter – a perfection without blemish or character, sanitized, safe, and soulless. 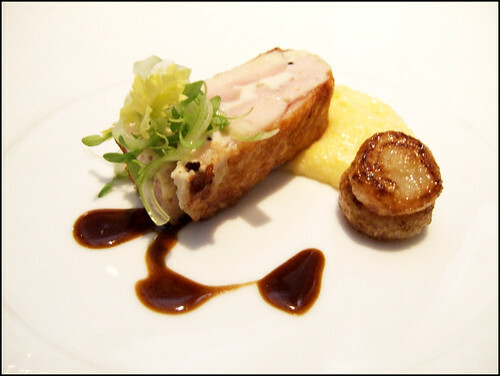 There is considerable debate as to whether an American Michelin 3 Star restaurant is the equivalent to French 3 Stars. I disagree with Michelin’s San Francisco 2 Star picks, but there’s no question a meal at The French Laundry is akin to 3 Star French dining. This was my fifth meal, the fourth in the past two years (see last review.) Things rarely go wrong here; and the food even less so. But the myth has taken on a life of its own. The expectations are so high that philopsophical and practical consideration must be taken into account before eating. Many food bloggers, particularly Refined Palate, have had transcendental meals at TFL. Others, while pleased, expected more. Philosophically, TFL plays it safe. Asian flavors and ingredients have crept into the repertoire but the menu still reads mostly French. 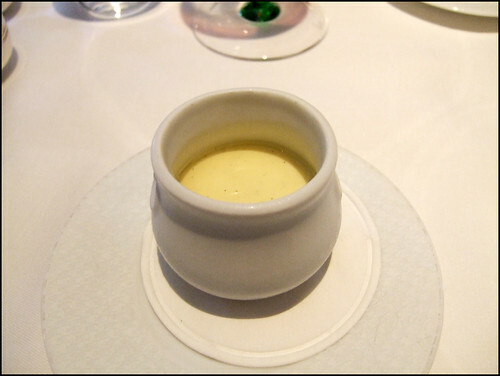 It’s Continental cuisine that is enhanced by some of the chemist techniques, but it strives to be an effortless cuisine, not one of shock and awe. Taste is valued over intellect, but a witty playfulness can be seen throughout the menu (look for the quotes.) If you expect the cutting edge, you will be disappointed. Practically, TFL is still subservient to mother nature. My meal in March was the least impressive but we ate during a dead spell in Bay Area produce. This cuisine relies on prime ingredients; if it’s not in season, you probably won’t see it. If it’s not a season, the food can not rise to a 3 Star level. After that March meal, I wanted to try TFL during prime vegetable season. After some back and forth, I was able to secure a date. Unfortunately, that date fell through and I gave away my winning lottery ticket to Olivia (she is one of the restaurant’s biggest fans.) After some more back and forth, I was awarded a Sunday lunch – perfect. Throw on the suit, hop in the car, and take off! A fast car for a short drive and slow meal. Upon arriving in Yountville, once a country town, you’ll find resorts, restaurants, and other inspired businesses thanks to the TFL money machine. The TFL building certainly has the charm of a countryside French restaurant, nearly hidden in plain view. Inside, the mystery of the building turns to a staid and dull, somewhat stifling, atmosphere. The tables are close and the conversation level can be unbearably quiet downstairs. KR Connect has an apt piece on the flaws of the space. A majesty still permeates the rooms but its power comes from the restaurant’s reputation instead of the space itself. From there, you choose between a Vegetarian or Chef’s Menu and prepare for the food. Be very very hungry. I substitued this dish from the Vegetarian menu (which I nearly ordered) because I had the Cauliflower Panna Cotta last time. This sounded like a sensual and refreshing way to begin the meal. 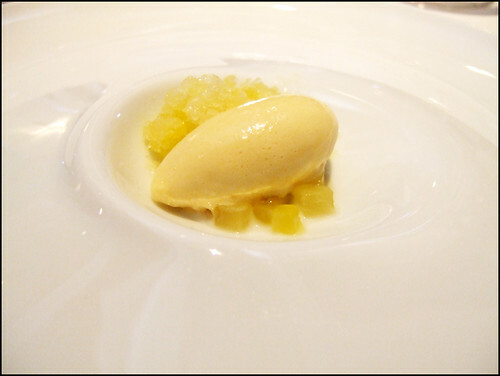 The pear flavor was bright and tart while the coconut foam tempered and cooled it. The basil seeds added the faintest of sparks. I suspect this is a Keller-approved dish from chef de cuisine Corey Lee. 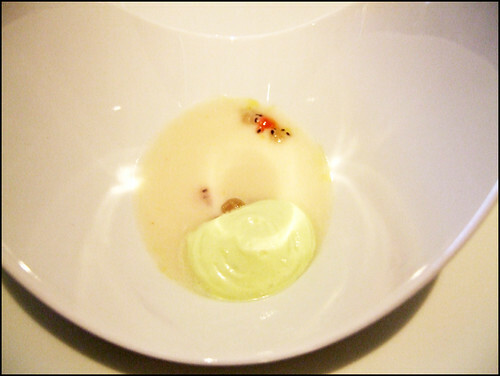 It was subtle and precise but not quite as sublime as Ledoyen’s Cuttlefish with Almond Milk and Lavender Foam. Very Good. This was a perplexing dish – truffles are nowhere near in season and they lent a heavy hand to just the second dish of the day. The truffles had the faintest of truffle tastes, nothing like Les Ambassadeurs from February’s Truffle Trip, but its heaviness bothered me most. Afterall, it was a hot afternoon and I was still expecting 8-10 more courses. Ok. There is nothing as sublime as TFL’s foie gras terrine. It is worth every penny of the $30 supplement. 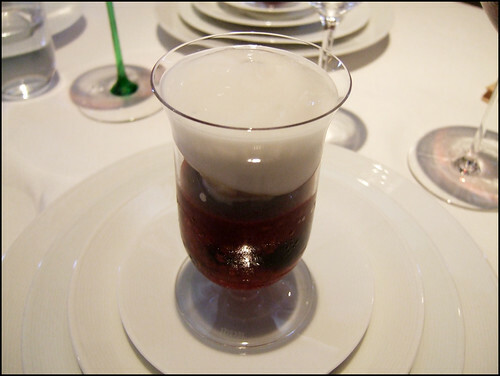 Its near whipped-cream texture is as ephemeral as a meat-based dish can get. 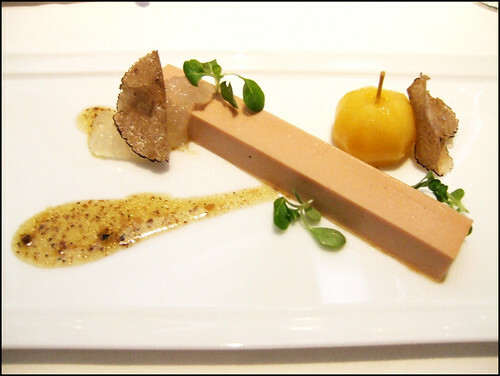 It is akin to eating the essence of foie. It is generally served with a variety of sea salts, ranging from different continents and millenium. Sublime. Besides the egg, the weakest dish of the night. The octopu was cooked nicely, a bit mushy but still firm, with an excellent charred flavor. Its cast did nothing to elevate or detract – they were just around for the ride. Ok. 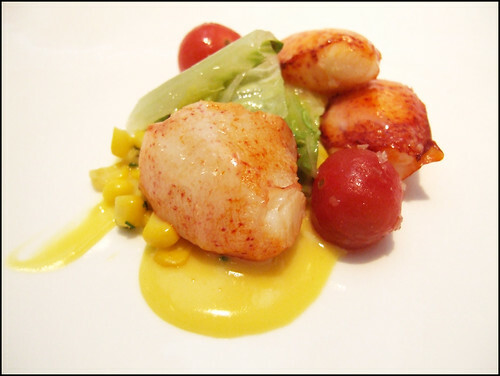 The lobster and corn were the two main stars of this dish – their different sensations of sweetness playing off each other. This lobster wasn’t the sweetest specimen and it was every-so-slightly over-cooked but the dish was a winner. TFL lobster dishes always impress. Very Good. Most Americans may never understand what real chicken tastes like thanks to our industrial breeds. I’ve had Four Story Hills Farm poularde at Manresa and other restaurants but this particular bird had a remarkable taste. The texture was firm and its chicken taste was nearly as intense as the Heritage chickens I buy from Prather Ranch. This was French quality chicken. Again, black truffles made an unnecessary appearance but I just disregarded them. Excellent. 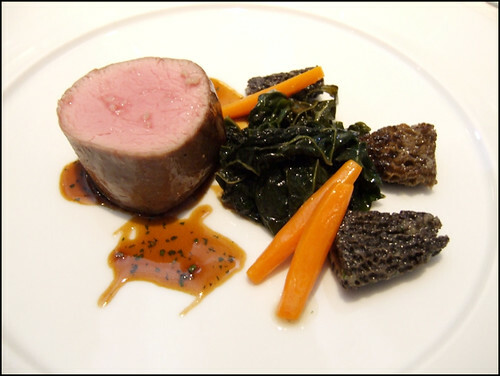 Veal often disappoints me because it is usually tasteless. This veal, however, was quite special – succulent to the point of decadence and full of flavor. I’m unsure of what “nature-fed” means; mother’s milk? Regardless, a remarkable piece of meat. The morel mushrooms reminded me that while I can buy great ingredients, I will never cook them at this level. Excellent. 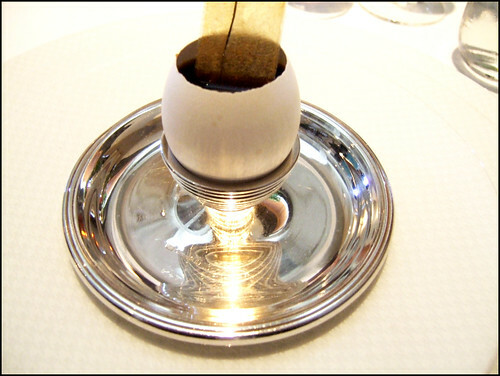 When compared to its regional competitors, The French Laundry occupies and owns its niche. 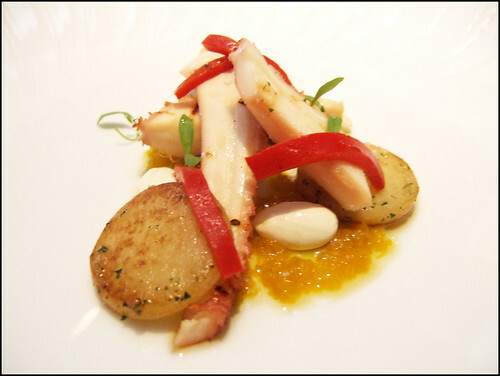 Manresa is the contemporary choice with superior fish and (bio-dynamic) vegetable ingredient quality. TFL is a more classic choice with very good fish and vegetable quality and excellent meat. Quince, the better Chez Panisse, has a pared down conceptual style (it’s Italian) with high quality meats and vegetables. I’d rank them in the order I’ve listed them but your desires may differ from mine. As everyone else ends their reviews, “was it worth it?” Taking money out of the equation, this is one of the better meals you can eat in the US. In fact, this was my best meal at TFL. After the relative disappointment of NYC’s finest awhile ago, The French Laundry definitely creeps up in the rankings and it would probably make my Top 5 US (behind Manresa, Urasawa, Providence, and possibly Alinea.) When money is factored in, at a cost of $400/pp, it’s still worth it but only on occasion. the photos were taken during the day. despite being sat next to a window, there wasn’t that much light (but still a bit more than your typical dinner.) lunch is the way to go if you want great pictures. You’re so right…expectations play a major role in how you feel about your meal. Glad to hear they’re still holding their own. Very thought-provoking post and nicely written. Excellent photos and the best I’ve seen on your blog! Even with the help of lunch lighting, these are well above the norm. I had black truffles in a dish when we went in May and asked about their provenance. They were the truffles I had heard about which the restaurant buys in season and freezes with a special technique they’ve developed. If I remember correctly, they said they don’t shave well, but are better than any alternatives for off-season fine truffle gratings/dust and saucing. If you make it below the Mason-Dixon line, put Le Reve and Restaurant August on your list. 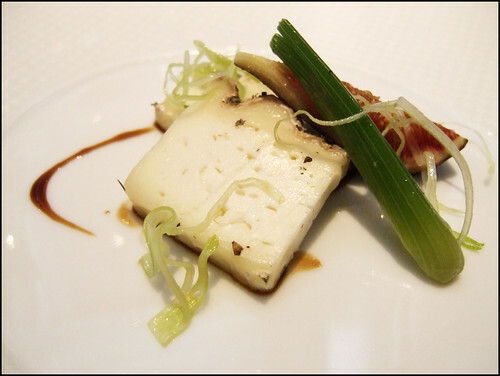 Le Reve is the more traditional, less ambitious and better executed version of French Laundry. I recently had dinner at both and I had a better meal at Le Reve. I suspect a big part of the reason why is that Andrew Weissman refuses to open the restaurant unless he is able to cook the food himself, while Thomas Keller has comfortably settled into being a CEO more so than a chef. A friend who has been thought numerous two and three star restaurants in France was underwhelmed. The tasting menu at Restaurant August is not quite a refined experience, but it does a great job of capturing New Orleans. Not everything works and too many dishes are draped in flavorless truffles, but it’s the best time I’ve had at a dinner in as long as I can remember and more often than not the food is outstanding. Make sure to tell them if you are against having to wear a bib and crack boiled crawfish open with your hands ahead of time, if you find the concept barbaric. I’d recommend sticking with it, though. One of the best dishes of the night. Both places had more memorable dishes than French Laundry. Good call on Manresa, BTW. One of the few restaurants I cannot wait to revisit again.